I am working on an formula race car using an Audi V8 3,7l with a G4 extrem ecu. I use the original the two hall effect cams sensors (for vvt), 5 teeth trigger wheels. The crank trigger Wheel is a specific 60-2 one and i use a magnetic sensor. When i run the engine, i have no spark and no injection, but when i use the test mode, everything is working. I think my ecu cams setup is not correct (attach picture). If someone can have a look to my base setup map and explain me what i done wrong . I cant find any info on google about what the std Audi AEW trigger pattern looks like but I think to run sequential & VVT and use that cam trigger you will have to use one of the OEM type trigger modes (not multitooth/missing). Does that engine normally have 60-2 crank wheel? If both crank and cam trigger are stock then the Audi 4.2V8 trigger mode may work? If the crank trigger was not originally 60-2 then I think you will have to modify the cam wheel or run batch fire/wasted spark. I'm sure the Link techs will give better advice since they should have access to more info of the OEM modes. Cool project BTW, running ITB's?. Adam is correct, unless you only have one tooth on the cam it is much more likely that you will need to use one of our OEM trigger modes. I recommend trying the 'Audi 4.2L V8 VVT' trigger mode. This mode expects 60-2 on the crank pattern and 4 teeth (2 big 2 small) on each intake cam. The Inlet LH cam should be wired to Trig 2, and the inlet RH cam should be wired to Digital Input 1. I use a magnetic sensor for the crank, i don't know if it's the original one is the same, and does it matters? My crank sensor don't have the same trigger offest as your V8 audi 4,2L trigger mode can i modifie it? The cams sensors are wired exactly like that. So the engine will run in full group injection and wasted spark? I try that as soon as possible, thanks for your help. And for Adamw, yes it is running with itb's , special exaust, and dry sump. i can't use the original crank trigger Wheel because the engine as a specific small flywheel to match with the hewland box. The information I have says that the sensor on the 4.2L V8 is a reluctor type sensor, so your sensor should work well. Yes, you can modify the offset to your requirements, Once you have the triggers reading correctly (with no trigger errors) and the ECU calculating engine speed correctly, the ECU will know the engine position within a 720 degrees (4 stroke) cycle. Ignition can then operate in direct spark mode and the fuel can operate in sequential mode. I've done the modifications, and with a -80 degres trigger offest the engine start but only on 4 cylinders. i have only an ignition spark on the 4 first cylinders (of the ignition order). in the ignition setup i've choose direct spark because i have on coil per cylinder, and when i use the test mode, the 8 ignition sparks are ok.
Not a lot comes to mind to be honest. Are you using external ignitors, or do you ignition coils have built in ignitors? Are you getting trigger errors? It would be useful if you can post a TriggerScope image, your base-map, and a PCLog of you starting the engine. Here is the bas map done. The coils have built in ignitos, all are working in test mode and i don't have trigger errors. the 2 cams sensor triggers are the same, when i use the left cam sensor as trigger 2, i have the first 4 coils (in the ignition order) working. When i use the right cam sensor as trigger 2, the 4 other coils are working. I try to get a log of the starting quick, what do you mean by a trigger scope image? is there a function in the software or you a image taken from my scopmeter? what do you mean by a trigger scope image? is there a function in the software or you a image taken from my scopmeter? I think Scott forgot you have a G4. The trigger scope function is only available in the G4+. If you do have access to an oscilloscope however I think that would be helpful. 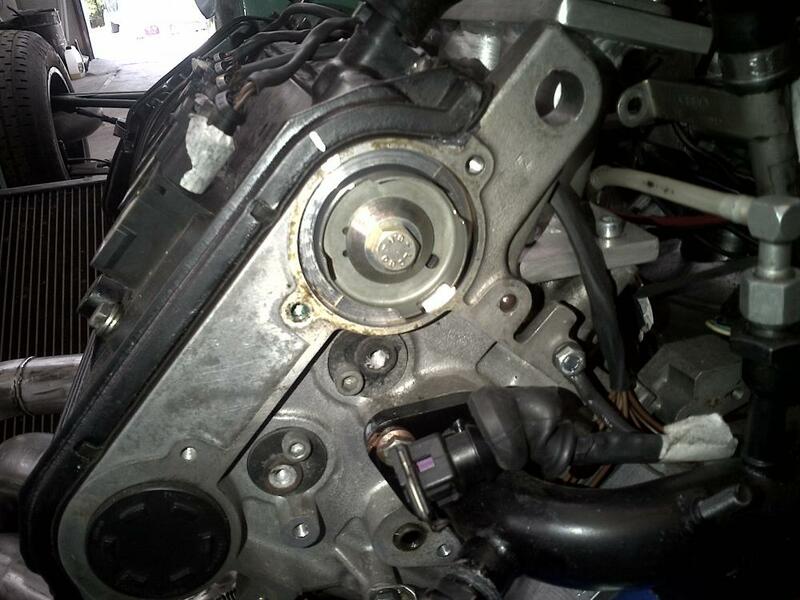 Do you intend to keep the VVT functional or are you planning to lock the camshafts? Adam is right, I forgot you were using a G4 ECU, so no triggerscope for you. Can record a PCLog of you trying to start the engine with trigger 2 connected to the Inlet left hand cam sensor and upload please? I looked into our information on the Audi V8 trigger mode, and it says to use a trigger offset of 292, maybe you could try this also. Yes i have acces to an oscilloscope if needed. For your trigger mode, remember i use as special 60-2 trigger Wheel on the timming belt side so the trigger offset is different of the original audi one, but i try it . i'll make a record of the engine start hopfully this week end. Another idea is to try offsetting your trigger offset by 360 degrees, so for you this would be a value of 280. 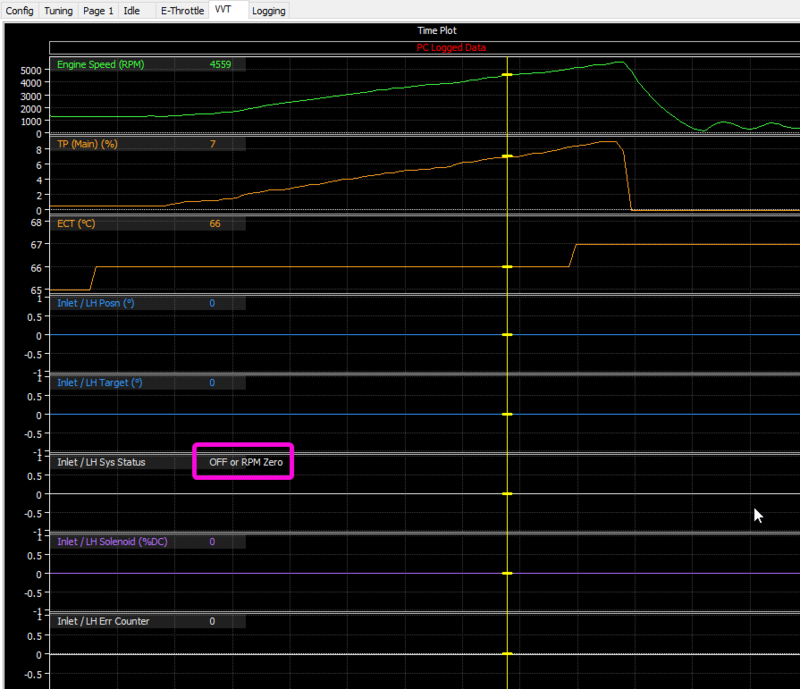 In attach files, the record the two tests with -80° and 280° offset, the engine start every time on 4 cylinders. Thanks for the log files. Looking through them I can see the engine speed is jumping up to 19000 RPM at times. Despite no trigger errors being logged this indicates that there is a problem with the trigger setup. Looking through our trigger mode information it looks like the 'Holden V6 Alloytec II VVT' trigger mode could be worth trying. You will need to re-check the base timing after switching to this mode. I try that and log it . After this long time the engine is running ok and nearly ready to be mapped on the dyno. I still have a problem i can't solve, the 2 vvt cams are not working . I use the trigger2 as cam sensor1 and DI2 as cam sensor 2. When i run the engine, i can see cams positions but they don't follow the target. I think i've done something wrong but i don't what. I send you the starting map i use actualy, may be you will find what's wrong. I dont see much wrong in your settings. If you confirmed the aux outputs are controlling the correct VVT solenoid (i.e, not swaped). With engine off, ignition on, you can set Aux 1 to "Test (PWM)" to check the correct solenoid clicks. Can you also do a PC log with the engine running so we can see if there are any other clues. We've check the combinaison outputs and vvt solenoid, it's ok, but the vvt still not work. I've put 20° in the vvt table and log the engine running. One cam doesn't move and the other goes from 0° to 40° directly. see the log file attached. may be you'll see what's wrong. You log file says the VVT system was not enabled at the time. Maybe cam angle test was turned on? Can you do another log with the system enabled? When you run the cam angle test do you get stable numbers reported? Back to work on this car, vvt are still not working, but this time i've check again the wiring witch is ok (12v on one side and connected to the aux on the other) . The electrovalves does not work, are connected on aux 1 and 2 set to "vvt controllers" . When i set the aux to "pwm test" 50hz Nothing happen i Don't ear them working. i've tried as well to connect them on aux 3 and 4 and same result. DOes the engine has to run to test the auxiliary? No, the engine does not need to be running for the auxiliary test function to work. I would have expected you should have heard them click. If you connect 12V and ground straight from battery do the solenoids click? (solenoids unplugged from ECU). You can confirm the ECU aux outputs are working with a test light or similar. I've check direcly the solenoids on a battery and i can hear them clicking. My Customer had made his own loom leaving all the unused wires so i've took of all the unused pins from both connectors. I've tested the aux 1,2,3 and 4 with a test light (connected on the 12v on one side and aux to the other) with the "PWM test" and the "On test", and the aux outputs are still not working . If you are not seeing the drives pull to ground in the test mode then that points heavily to a damaged Aux driver chip. Ok Can you tell me where to send it and how to proceed?